Korean artist Kyung Woo Han’s Green Room is a mesmerizing feat of design. 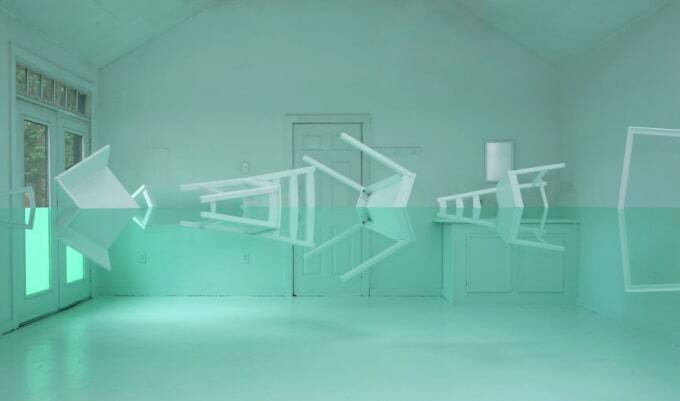 Using two shades of sea foam green, custom made furniture, and some sturdy wires, this innovative artist has put together a piece that is so mind-bending viewers can hardly look away. The work is reminiscent of creative perspective-benders, such as Salvador Dalí and M. C. Escher, and color purists, like Josef Albers. The work might also function as a psychological test (like a Rorschach ink test). “People see what they want to see,” the artist ominously told It’s Nice That. In that sense, the work is as much an opportunity for viewers to engage in self-reflection as it is a reflection unto itself.